Counting sheep is so 20th century. TodayÍs restless mind has an overload of images that makes it so hard to slip into a natural, deep sleep. 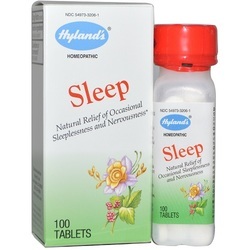 Hyland's Sleep (formerly Hyland's Insomnia) is a traditional homeopathic formula that blankets your mind with relief from stress and worry. * It helps you fall asleep, and when you awake _ thereÍs no sedative hangover. ItÍs also safe to use with other medications.